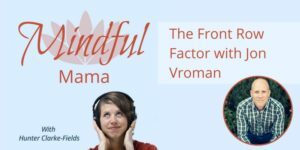 Yes, I cried a little in this conversation, but more than that, I was inspired by talking to Jon Vroman about his work with the Front Row Factor and helping to make dads more conscious. The power of dedicating your life to making a difference – as Jon says, choosing our experience. The power of reminders and intimacy with death. We have 936 weekends from when your child is 0-18 years old- every one that goes by is a weekend you won’t have again. Jon Vroman inspires others to Live Life In The Front Row™ by teaching the art of moment making. He is an award-winning speaker, #1 bestselling author of The Front Row Factor, podcast host and founder of Front Row Foundation, a charity creating front row experiences for individuals who brave life-threatening illnesses. Connect with him at www.FrontRowFactor.com.